You open the door one morning and are immediately blasted in the face by intense cold or heat. Global warming has paid your town a visit, and it brought all of its buddies, leaving the climate on one side of the temperature extreme, and you at its mercy. With this in mind, you probably aren’t in the mood, necessary as it may be, to get into your car, which has no doubt become either a pressure cooker or a refrigerator on wheels. If only there was a way to turn on your car and have the air conditioner running long before you got in the car. Well, your prayers have been answered. 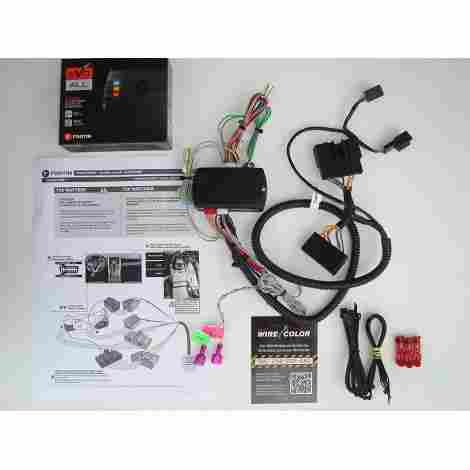 Kicking off our list, we have our first entry, the Factory OEM Remote Activated Plug and Play Remote Car Starter. Despite the name taking up half a paragraph in and of itself, you’ll find the plug and play to be more than what you’re looking for when trying to find a remote car starter for your Chrysler, Dodge, or Jeep. With a lot of remote car starters, you typically have to keep track of a separate device apart from your car remote, which you use to activate your car remotely. However, this starter doesn’t have that problem, wiring itself directly into the same system as your key remote. Now, if you want to activate your car, you simply need to press the lock button three times in succession. With lesser models of remote car starters, it usually falls to you to figure out how to wire the thing, and then you have to figure out how to install it. Seeing as how we’re just going to assume that not everyone who reads this is an expert mechanic, experienced in electrical wiring, this is not the best setup. Fortunately, while it still falls to you to install it, this car starter is 100% prewired. Of course, such devices like these do not come cheap, and if you want the really good models like this one, you’d best be ready to ante up. Thankfully, by the metric set by this list, the price of this car starter is actually not that bad. 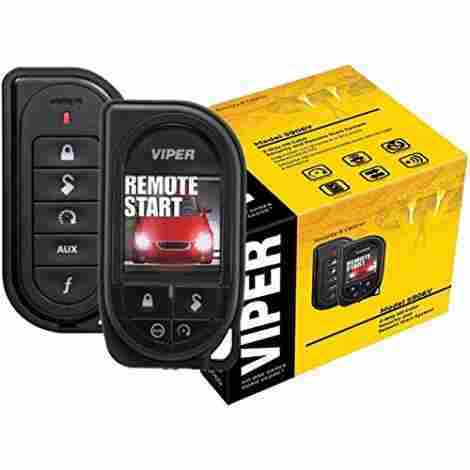 Coming in second place is the Viper 5906V Color Remote Start and Security. If you want the best of the best when it comes to remote car starters, there are two brands that consistently deliver in this area. Viper is one of them. So, let’s find out why. If you want to get your car started and warmed up long before you get to it, like if you’re stepping off a plane and want to have your car nice and ready when you get to it, then you’ll be happy to know that this remote car starter has a range of up to one mile, which is a lot farther distance than it sounds. While this starter doesn’t come with a camera, it does come with a simulated image of your car, shown on a small OLED display. This image serves as confirmation that the signal is actually getting through to your car, as if you turn it on, the simulated car on the screen will also turn on. Handy for those skeptical of technology and needing that extra assurance that yes, it’s working properly. Remember how we said that the price for the previous entry was considered tame when compared to its peers. Well, meet the eponymous peers. While not the most expensive entry on the list, that fact is not for lack of trying. 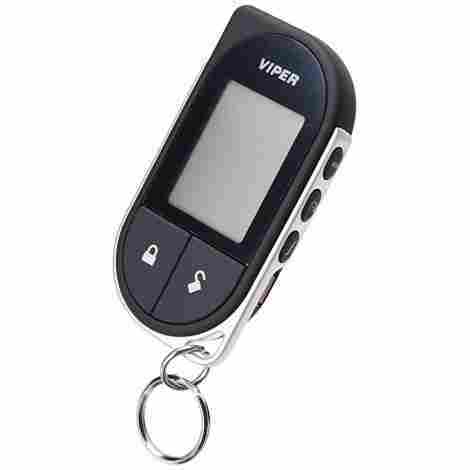 Finishing up our top three segment, we have the Viper 5706V 2-Way Car Security with Remote Start System. As we said, Viper is one of the top names in remote car starter technology. And while it might be the last entry from them on this list, the 5706V does more than enough to earn this top spot. There’s nothing worse than coming out to find that your car has long since been stolen, with you none the wiser. 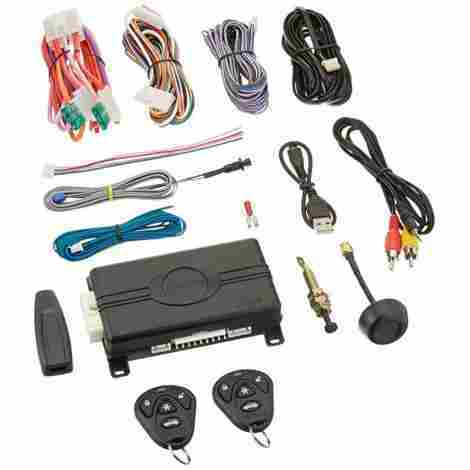 But with this car starter, you will be immediately notified on up to 4 different channels that someone is tampering with your vehicle without your express permission. You can then notify the proper authorities and get the matter settled before you lose your property. Need to open your door or trunk, but have your hands full? No problem, as this car starter has you covered there as well. If your car has the capability of having a device like this installed in it in the first place, then it likely uses some kind of electrical locking mechanism for the door and trunk, which this car starter can access. So, with the push of a button, you can open any door or trunk on your car. While still pretty pricey, this remote car starter isn’t anywhere close to the previous entry’s price, so if you want a top shelf remote car starter for a modest price, then you’re looking at the right device. Coming in at #4, we have the Avital 4105L Avistart Remote Start. Earlier, we said that Viper shared the distinction of being the best remote car starter manufacturers. Well, Avital is their biggest rival, considered by many to be the option for the car owner on a budget, which has allowed them to keep pace in the market. But let’s see what else they have to offer. Even if you’re an expert with mechanics and electrical engineering, in general, the fewer wires you have to constantly deal with, the better. Which is why this car starter comes equipped with a dedicated A-to-D converter, which samples your car’s voltage hundreds of times per second. This eliminates the need for a tachometer wire connection completely. Do you have other interface systems or devices in your car? If so, then you know that the less interference they have with one another, the better. So, it’s a definite benefit that this remote car starter can interface with almost any other interface device you have in your car, thanks to a D2D serial data port. The best part about this entry is the price. Gone (for now) are the triple digit prices, and we have a very advanced car starter, for a very reasonable price. 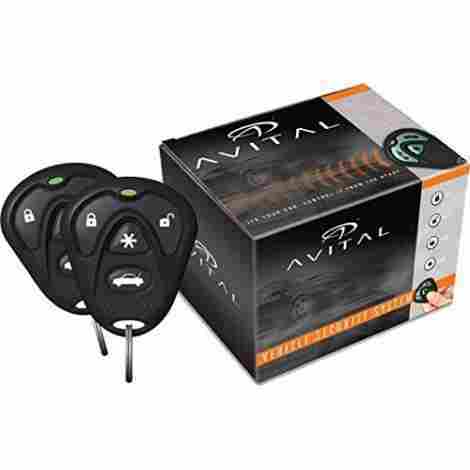 For our 5th place spot, we chose the Avital 4113LX Remote Start with Two 1-Button Remotes. At first glance, this seems to be about as simple as it gets for a remote car starter, and in some ways, you would be right. But a closer inspection will reveal that this car starter has a lot more going on. If your car is being broken into, you could call the police, and then have to wait up to 8-10 minutes for them to arrive. A carjacker can cover a lot of ground in that time, so it’s better to stop them beforehand. Fortunately, any unauthorized tampering with your vehicle and this remote will automatically send the car into panic mode. Because of the panic mode, it stands to reason that anyone who wants to get in your car for legitimate reasons without you immediately there (like if they forgot something in the car) would want a means of getting in without sending the car into a hissy fit. Which is why this car starter comes in a set of two remotes. While a bit more expensive than the previous entry, this remote car starter is still very affordable by the standards of this list. 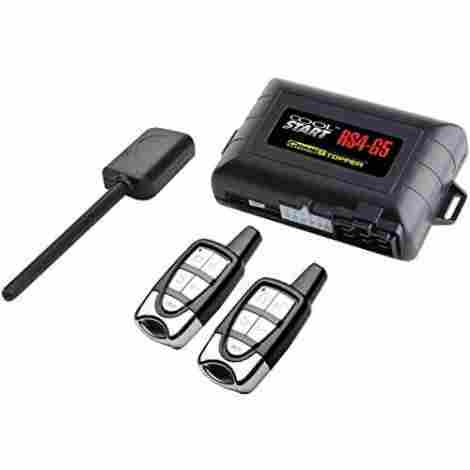 Coming in at #6, we have the Crimestopper RS4-G5 1-Way Remote Start and Keyless Entry System. Crimestopper is considered the third head of the three biggest dogs in this niche market, and while their products aren’t quite as excellent as Avital or Viper, they still, as is the case here, turn out an excellent entry when the mood strikes them. If another vehicle has this system installed in its wiring, and you need to get in, then you’re in luck. Among the usual buttons found on these remotes, one for locking and unlocking respectively, one to start the engine, etc. there is also a button to provide multi-vehicle compatibility. But don’t think that that’s all this system is capable of. In fact, if you know what you’re doing, you can program in up to 31 features into this system, including tachometer features, hybrid modes, and engine monitoring. So, if you want to get as much out of this system as you can, then have at it. This may be the cheapest entry thus far. At just a little below the #4 entry, this remote car starter is the ideal choice for the car owner on a tight budget. For the #7 spot, we decided to go with the Avital 4103LX Remote Start System. Returning to Avital one last time, we go out with a bang, as this is easily one of the best entries in the company’s remote car starter lineup. What makes it such a great piece of hardware? Let’s find out. Need a valet to park your car, but want to make sure that this complete stranger you just met doesn’t go running off with your car? Get your hands on this car starter, which is outfitted with valet mode. With it, you can keep the car running, even after the ignition key has been removed, which you can turn off and on with the push of a button. So, when the valet returns and tells you that your car has been parked, you need only push a button, and the car will shut off until you’re ready for it. Parking in a suspicious area? A push of a button will enact panic mode, a mode that will cause the car to go on alert if it detects any kind of tampering while you’re away. However, let’s say it’s in the middle of the night, and you’re on a street where a lot of people are sleeping. You probably don’t want to disturb the whole dang street over a single carjacker. So, the panic mode alarm bell is optional, whereas the car will instead flash its parking lights, alerting any authorities nearby that the person driving the car should not be doing so. As is typical of Avital at this point, this is a very affordable remote car starter that provides excellent service and security despite the low price. Though the valet mode function does ratchet up the price a tad, it isn’t by a lot. 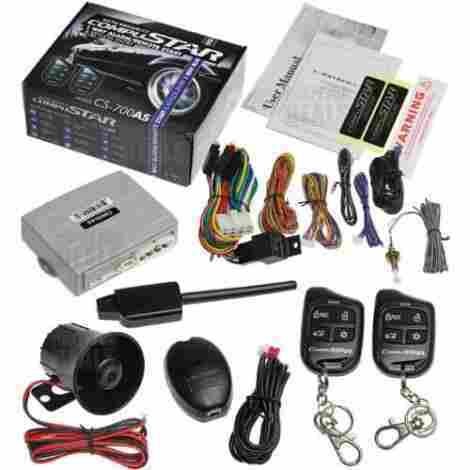 Kicking off our final three entries, we have the CompuSTAR CS700-AS Car Alarm and Remote Starter System. If what you’re looking for is the finest in efficient security technology, then you’ve found exactly what you’re looking for with this beautiful piece of hardware. Allow us to elaborate. Most cars let out an alarm siren when the window is broken from the outside, but sometimes you come across those clever thieves who know how to bypass those systems before breaking in the window. Which is why this system acts as a backup, letting out a 6-tone siren whenever its dual stage shock sensor detects an external impact. But a remote car starter is only as good as the transmitter you use to activate it. And fortunately, this entry has one of the best. A four button transmitter with LED light for added visibility, this transmitter has a range of 1000 feet, and will immediately have your car do whatever you command it to do at the push of a button. While not quite as expensive as the earlier entries on this list, this is still a far cry from the affordable prices of the immediately preceding entries that came before this. 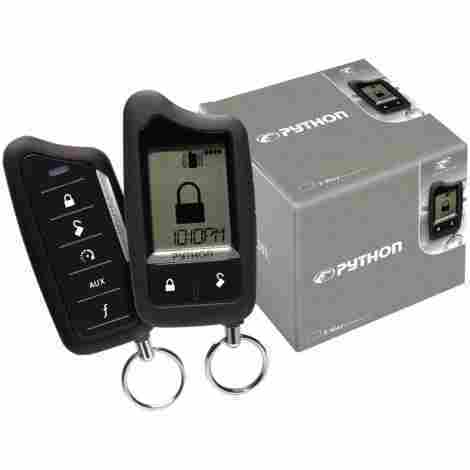 For our second to final entry, we have the Python 5706P Responder 2-Way Security with Remote Start System. While not likely to blow any minds, especially those experienced with this technology, the Python is more than reliable, and won’t let you down when you need it. When you first get these remote car starters, it can be hard to keep reminding yourself to keep track and bring it with you when you need it. So, to help you along, this remote car starter comes with a smartphone application you can download onto your iOS or Android, and use to do basically the same thing as the transmitter if you’d prefer not to have to keep track of another peripheral. What do you do when someone breaks your car’s window to steal it? Or just accidentally rams into it because it’s too dark to see where they’re going. This is where the integrated shock sensor comes into play, keeping you constantly apprised of the car’s physical condition, particularly when that condition changes due to a sudden impact. The main problem with this entry is its price. We’re well back into the triple digit price ranges for this entry. In fact, in its lineup, this is considered to be one of the cheaper varieties, which should say a lot. For our final entry for this list, we have something a bit different, showing the Yescom 2 Way Motorcycle Alarm. While you can use this for a car, its primary use is for motorcycles, doing for your motorbike what these other entries do for cars. So, let’s close out this list and see what it brings to the table. Maybe you want your motorbike to be as quiet as a mouse when you leave it behind. Most remote vehicle starters will have the vehicle emit a loud noise to notify you that the function has been enacted. However, if you would prefer that not happen every time you press a button, you can just use the optional silent mode to make the motorbike completely silent when you activate one of its features. Let’s say you’re on your way back to your bike when you see some shady characters taking a liking to it. You would rather them keep away from it, and the siren only usually activates when the bike is tampered with (assuming your motorcycle even has a siren, which is rare). Fortunately, you can scare them off with the press of a button, by using the programmable, powerful 125db siren. A rather average price for a remote vehicle starter of its kind. While it doesn’t offer quite as many security options as the other entries on this list, that’s mostly due to the fact that the others on this list are meant for cars, whereas this is meant for motorcycles. There’s nothing like a good remote car starter to give you that extra bit of efficiency you need from your vehicle. 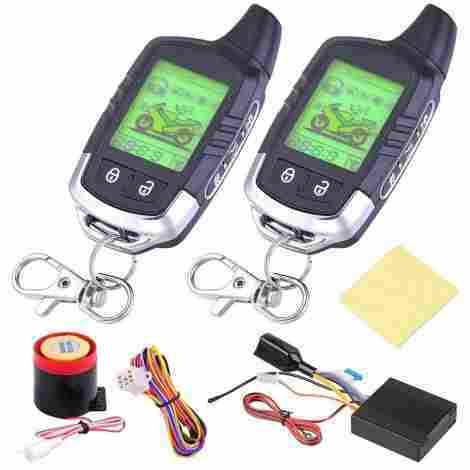 Whether you’re getting one for your car or motorcycle or whatever else, having a means by which to remotely activate the car and even enact some security or safety features as well is always appreciated. While this is by no means a required feature, it is definitely a luxury that you will find a lot of use out of. From warming up your car before you get in on a cold winter morning to activating a panic mode to ward off potential thieves, to making sure that a valet actually parks the car where you want it to be parked. And if even one of those sounds like something you could really use a remote car starter for, then we can’t recommend these ten entries enough. All of them bring something different to the table that puts them above the rest of this niche market in terms of quality and efficiency. So, if you need a remote car starter in your life, look through this list, find one that you like, and enjoy. Assembling a set of criteria for this list was certainly an interesting experience, to say the least. This is very niche technology we’re dealing with, and a lot of technicals go into it that you don’t see in this sort of article very often. However, through diligence and research, we managed to come up with a good list of criteria. So, with that said, here are the most vital criteria we used to judge what entries got on the list and where. Seeing as how a remote car starter lives and dies on the quality of its transmitter, a lot of the criteria for this list came from that source. And one of the most important qualities for a transmitter to have is a long range. After all, all of the high quality construction, high tech settings, and functions don’t really mean anything when you can’t get the thing to work because you’re more than a few inches away from the car. The typical range of a remote car starter transmitter is about 1-2 miles. Depending on the model of the transmitter, however, that range can be interrupted by certain objects like lead or even a large number of other cars. Also, areas like parking garages, where signals of all kinds are notoriously weak, will also be a problem. These are the general problems you have to worry about with all remote car starter transmitters, but some have it worse than others. These aren’t necessarily required, as there are plenty of entries on this list that don’t have security features. But better to have them and not need them, and all that jazz. This is a rather broad definition, but what we generally refer to are functions and systems put in place with the intent of deterring attempts of theft or otherwise tampering with your vehicle. Whether it’s a means of alerting the police to the theft, or an automatic activation of the car’s siren in order to scare off anyone you feel is getting too chummy with your car’s window. There are a great many different ways you can use a remote car starter to keep your car secure. Now, you may think you may never need these functions, and you may be right. But again, better to have and not need, than to need and not have. But beyond security features, there are also a number of miscellaneous features you can also add onto it if you want. You honestly have the pick of the litter here, seeing as how most cars nowadays have almost every feature be electronic to some extent. So there are remote car starters with the capacity to open the doors of the car, the trunk, turn on the lights, activate the alarm siren, and if you have the really big bucks, you can even get a remote car starter that will let you keep the car on even when the key is not in the ignition. So, if you want to make sure that valet puts the car where you want it to be, you can just keep the keys for yourself and turn the car off when they park it. And for certain systems, there are even security modes you can put your car in, even when it’s turned off. So, if your car thief is a crafty sort who knows how to hotwire a car, you can have the car turn itself back off the minute it feels pressure on the gas pedal. Like we said, most cars nowadays have mostly electronic components, which also means they have an onboard computer. But computers tend to get testy when a new computer system comes muscling in on their turf, so it can be a bit hard to install a remote car starter into these cars. Unless, of course, you have a remote car starter equipped with a bypass module. Because of the ubiquity of onboard computers, having a bypass module on your remote car starter should be considered mandatory, because otherwise, there is literally no way for the starter to work, even when installed. The onboard computer already there will treat it as an intruder to its system and lock it out. The bypass module will help the remote car starter to, as the name says, bypass those systems to grant it access. So, when you go to buy a remote car starter, always check to make sure that it comes with a bypass module. The last criteria we looked at for this list was the price of each item, and how it reflected back on the value of the item itself. What we mean by this is that the prices for these remote car starters didn’t have a lot of consistency to them. Sure, there are definitely some functions that are a guaranteed price ratchet, but for the most part, the functions and construction of a remote car starter have little bearing on the price of the device. Which is definitely good when you consider how much installing them is going to cost you. But for this list, we decided to judge each entry based on how well they could justify the prices they had. If the price of the remote car starter reflected the kind of service it provided, we were more likely to go easy on our judgment of the price. For the last segment of this list, we’ll be taking a look at some frequently asked questions surrounding remote car starters. These are complex devices that you have to pay a lot of money to both buy and install into your car, so it’s no wonder that most people would prefer to have as many of their questions answered as possible before making that purchase. So, with that said, here are the most frequently asked questions surrounding remote car starters, and the answers thereof. Q: Do I need to have a professional mechanic install my remote car starter, or can I do it myself? A: This all depends on the remote car starter itself. Sometimes you’ll have a remote car starter that can be installed DIY and be just fine. But other times, usually with remote car starters that have more complex components, you really do need to have a professional install it for you. Fortunately, the starter’s box will clearly tell you which side of the spectrum the one you’re looking at falls under, so just make sure to keep an eye out for that, and you should be just fine. Q: I have a remote car starter that can be installed DIY, do you have any tips for me when it comes to the installation process? A: First and foremost, read the manuals. Yes, manuals, plural. As in, you need to read both the manual for the remote car starter and the manual for the car you’re going to be installing it in. You need to know everything about both objects, top to bottom, to make sure that the two are compatible with each other, and that there’s nothing in either that will pull a fast one on you. Next, you need to make sure that the battery is disconnected. When the battery is connected to the car, people aren’t really meant to be rifling around in those areas, so there’s a lot of electricity freely flowing throughout. And on top of that, installing this device is going to involve a lot of soldering and new connections, so a reboot of the battery (i.e., taking it out and putting it back in) is necessary regardless. Finally, make sure that the place you’ve chosen to install the remote car starter is safe. As long as it has a clear and stable connection to the battery, technically you can put the starter anywhere. But it should always be somewhere safe and secure, where it’s unlikely to get damaged while driving. The most common spot pros like to install it is one of the panels under the dashboard. Q: I know that a remote car starter can help my security, but is there anything else you recommend I do to improve the security of my car? A: The best thing you can do, if you don’t trust the area you’re parking in, is to park somewhere well-lit and where there are a lot of people. People equal witnesses, which will discourage wrongdoing. The other thing you can do if that isn’t an option is to hide any valuables in the car since that’s what most thieves are after. Most cars can be tracked, but your diamond rings can’t. So, anything like electronics or valuable items should go on the floorboard where it’s harder to see them.